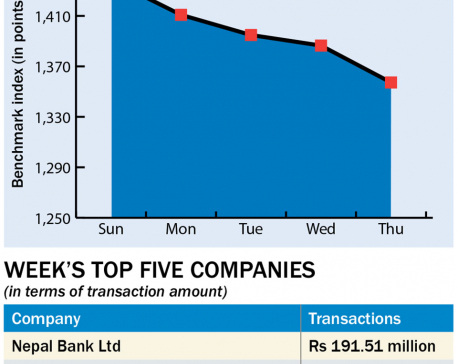 KATHMANDU, Jan 27: Nepal Stock Exchange (Nepse) benchmark index recovered 1.86 points this week to close at 1,404.53 points on Thursday -- the last trading day of the week. The stock market observed a minor recovery this week following a continuous slump in the last few weeks on account of rising interest rates of bank and financial institutions. Stock analysts have termed the recovery a normal phenomenon in the market. According to some stock brokers, recent political developments paving way for the election of national assembly has also lifted the confidence of investors who were worried about the continuous political bickering after the parliamentary and provincial polls held recently. The rising interest rates in the wake of shortage of lendable fund has also sent stocks downward as many investors found depositing their money in banks more profitable than in investing in stocks. Most of the trading groups ended in the green zone. 'Trading' group registered highest gain of 22.22 points to close at 213.77 points. Manufacturing and processing group followed the suit as its sub-index went up 7.66 points to close at 2,491.17 points. Sub-indices of Hotels and Hydropower climbed up 5.39 points and 3.49 points, respectively, settling at 2,144.23 points and 1,857.64 points. Banking, the heavyweight group, also went up 3.09 points and ended at 1,217.2 points. Development Bank inched up 0.79 point to close at 1,566.54 points. Finance group, however, ended 4.97 points lower at 716.47 points. Sub-indices of Microfinance and Insurance groups went down 2.69 points and 1.15 points, respectively, ending at 1,687.12 points and 7,193.3 points. 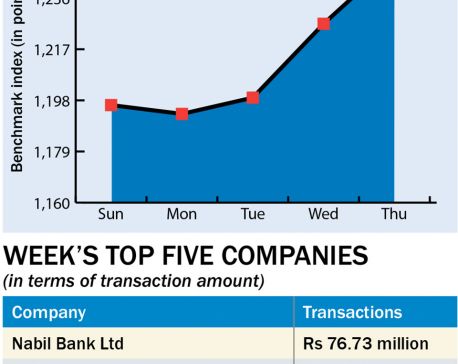 A total of 5.06 million units shares of 177 companies worth Rs 1.74 billion were traded in the market this week through 19,133 transactions. The turnover was 59 percent higher than the last week. 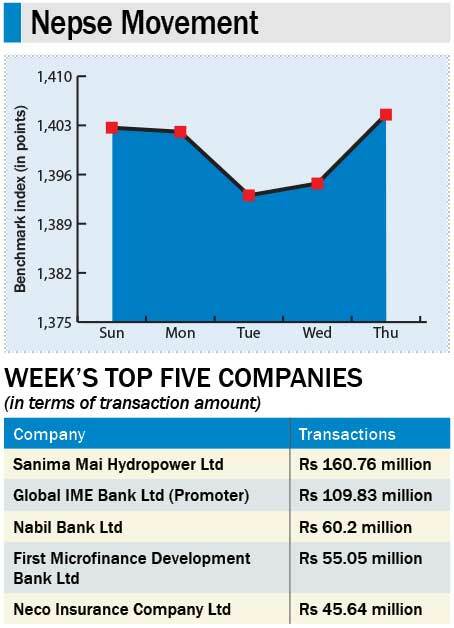 Sanima Mai Hydropower Company Ltd topped the list of companies in terms of turnover (Rs 166 million) while Global IME Bank Ltd stood first in terms of traded shares (615,000 units). It was First Microfinance Development Bank Ltd which topped the list of companies in terms of number of transactions (776). 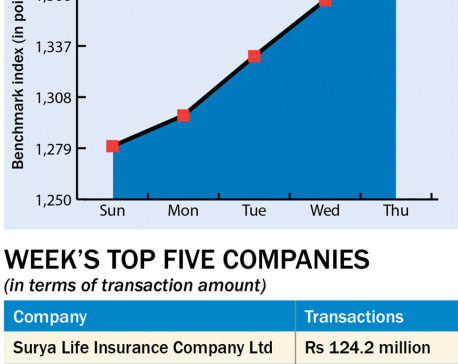 Bonus shares of Surya Life Insurance Company Ltd and rights shares of Om Development Bank Ltd were listed in Nepse for trading.